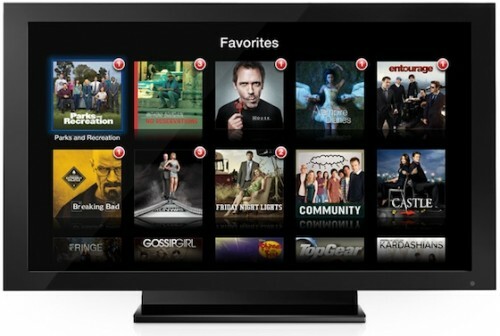 Apple Pushing Ahead with Plans for Subscription TV Service by Christmas? The New York Post reports that Apple is pressing ahead with plans to launch its own streaming television service by the end of the year, despite continued resistance from content providers. “They want everything for nothing,” said another media executive, echoing similar tense negotiations Apple has had in the past with magazine publishers and music companies. The report claims that Apple is interested in offering entire channels as apps that could be used on a number of the company's devices, including the Apple TV set-top box and presumably a potential Apple-branded television set. The report's sources are, however, unclear on whether Apple is seeking to bundle multiple app channels together to form its own equivalent of cable television packages or if it wants to offer them individually to subscribers. Sources also indicate that Apple has tried with no success to convince cable companies to adopt Apple hardware for their own set-top boxes, with Apple providing sleek hardware and software to deliver content to existing cable subscribers across the United States. “They want to create the interface, and they wanted to work with the cable guys to manage bandwidth across the TV and broadband pipeline,” said one source familiar with the talks. Instead, cable executives pretty much shut the door, preferring to keep Apple at a safe distance from the lucrative $150 billion pay-TV business. The report indicates that Apple is actually pursing content deals as its primary target in the television market, with the much-rumored Apple television set being a secondary consideration for the time being. Despite resistance from content providers and cable companies, Apple is said to still be pressing forward with a number of entities including Verizon and AT&T in an effort to land at least a foothold in the television content market. Apple was reportedly negotiating with content providers back in 2009 about developing a "best of television" package that could be distributed through the iTunes Store, but those talks failed to yield any deals and Apple reportedly abandoned its efforts for some time. But with talk of an Apple television set ramping up and the company reportedly having developed its own "new technology" for delivering video content, it seems that Apple is trying once again to find a way to make its own contributions on the content side so as to be able to control as much of the user experience on television as possible. I've always enjoyed Apple products, but after getting an iPhone and iPad recently, I really wish all the device interfaces I used were made by apple - DVR/STB, Car, Microwave, whatever. So many of the interfaces we use are just really crappy. $100 Billion could go a long way to developing their own content in house. See Lillyhammer from Netflix for an example as to how to do it right. It's time for Apple to set up an independent subsidiary that is the shining example of how to create content and get it directly in consumers hands. The technology is here (and has been for years). We're a good decade behind technologically because of the cable monopoly control over our boxes. It's time to end that. In 5 years, once they have FORCED the other players to join the 21st century, that business could be a really nice spinoff unlocking a ton of additional shareholder value. Fake article, or written by a poseur (or blathering idiot). The spelling of the Apple executive's name is "Eddy" not "Eddie". You'd have to be an absolute nitwit not to check the executive bios on Apple's PR site (http://www.apple.com/pr/bios/) to verify this information. Which is pretty unsurprising for today's tech media. Retina 55" television .03 inches thin.. This makes no sense, a TV is viewed at a much farther distance than an iPhone or iPad, making current TVs "retina" already. Apple's going to get the they want. The fear going through the studios must be palpable. If they don't submit to Apple's demands their competitors might and they could find themselves missing out on a lot of revenue and exposure. How many studios tried to pull out of iTunes only to come slinking back in when the checks stopped coming? I have no desire for any one company to have a monopoly on entertainment. So you'll have to excuse me for not getting excited about Apple wanting to "own" the television market. What would be revolutionary is giving me a flexible series of packages that I can build on. I love sports so I want a decent amount of sports but only enough to cover my local teams. I want on demand a la carte options for when I want to try a series out. Apple is good at getting companies to begin thinking again and get out of being "stuck on stupid"
I'm eager to see what we gain access to. Apple may have a lot of money but that money won't buy the major producers and cable companies. The "channel as an app" is interesting though. Fake article, or written by a poseur (or blathering idiot). None of which would surprise me from the New York Post. Which is typical for today's tech media. hahahahahah.....you can't be serious. Journalism dead due to a simple misspelling? Oh the Horror!!! Why would service providers such as Comcast and Verizon cave in to Apples demands? So they can lose business and make money for Apple?